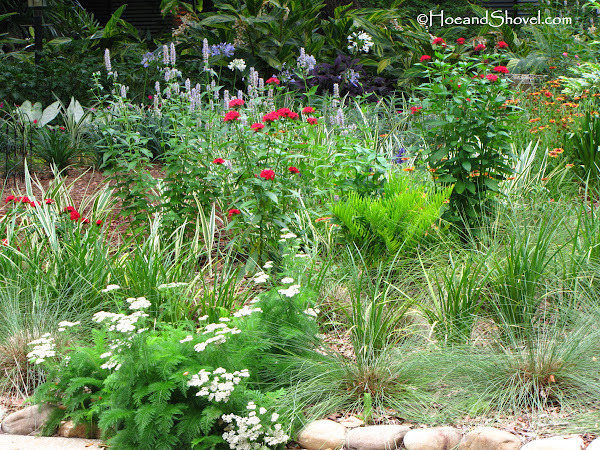 Every garden possesses its own unique beauty, characteristics, and charm. As gardeners no matter how much we appreciate the overall culture we've created it seems we develop preferences. 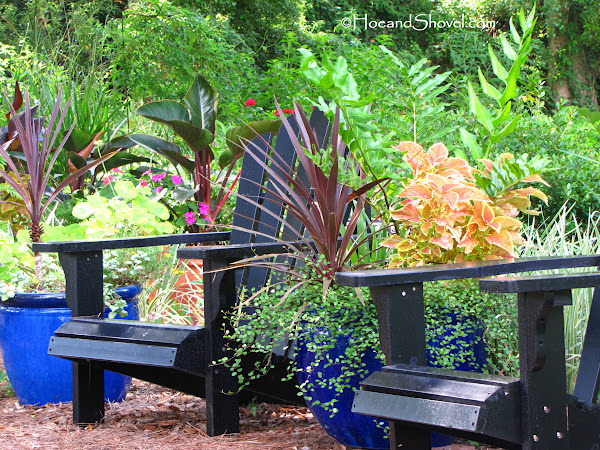 There is definitely favorite scenery, nooks, and niches that draw our attention more than others within the garden. These particular spots often change with the seasons. They aren't necessarily perfect in every way yet these choice vignettes prove to be fulfilling and pleasing to our senses as our eyes rest on them again and again. 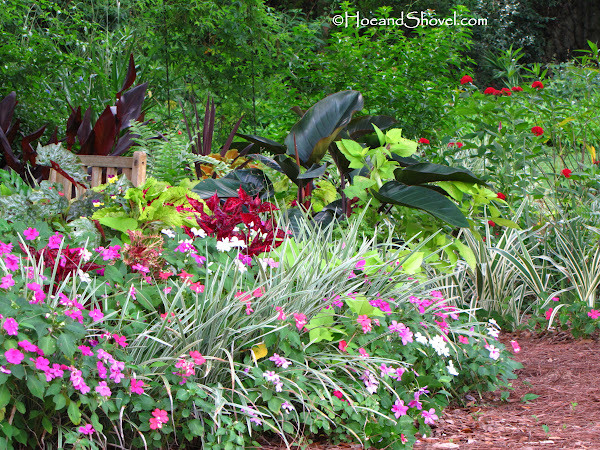 On the periphery of the circle garden impatiens seed themselves in abundance each spring. None have been planted in years. They are like weeds and even though they try to demand extra irrigation they are on their own to survive with the supply the rest of the garden receives. 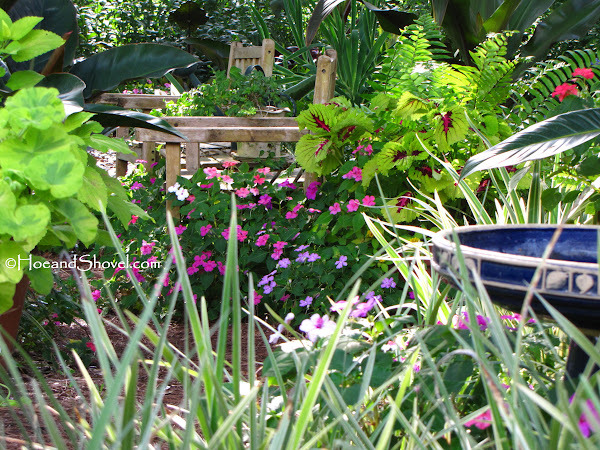 They do make a colorful addition to the mostly foliage entrance to the tropical pathway. Rounding that corner a fork in the pathway leads to either the butterfly garden or the tropical pathway that further leads to the way-back garden. This is one of the most peaceful settings in the entire garden. There are many niches along the stroll down the tropical pathway that urge me to pause. Stopping to reflect on the simplest delights that my garden provides refreshes my soul time and again. 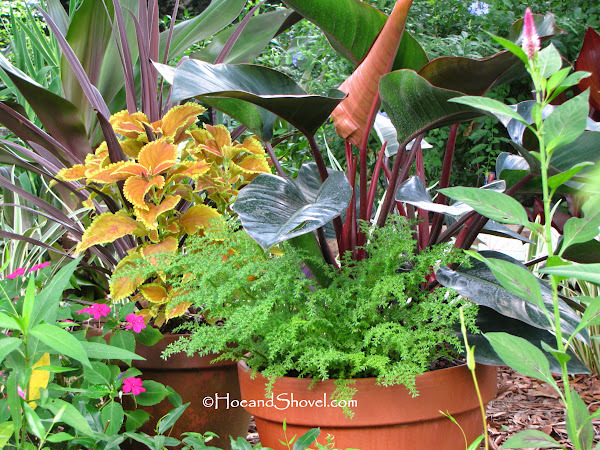 The nook with the red banana and roundleaf begonias (rotundifolia) surrounded by lush layers of plants is just one of them. A garden is the perfect place to work out the burdens of the day leaving them behind as we touch the earth and stress melts away with our toils. Layers and layers of textures, forms, varying heights and diverse hues all contribute to the quiet sanctuary within these borders. 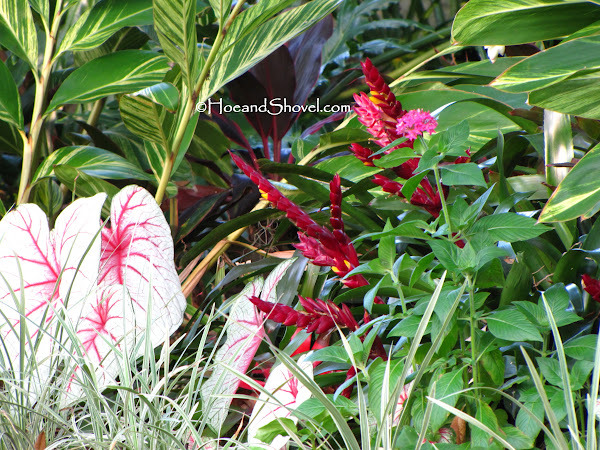 Tropical plants suited for protection from the intense sunshine under the mature oaks blend together in shades of red, magenta, yellow, and green. At the curve, behind the retaining wall, Miss Muffet caladiums snuggle up next to a bird's nest fern that rests between two large stones as if it squeezed itself naturally into that small bit of soil. Exiting the tropical pathway gives an equally soothing view. 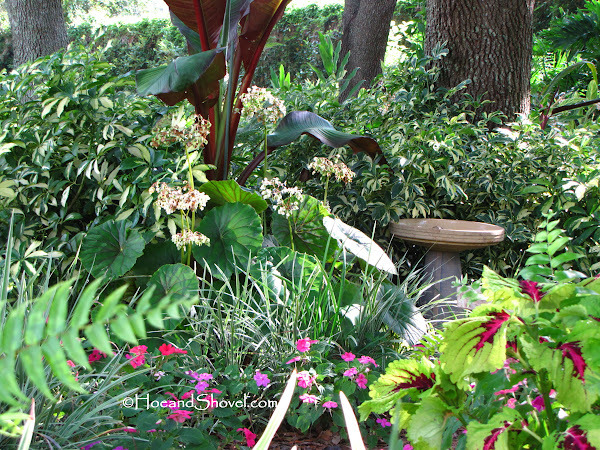 On the other side of the back gardens Florida-Friendly plants of bromeliads, White Queen caladiums, pentas, shell gingers, aztec grasses, cordylines all converge with the native gardens happily thriving in like-environments. The northside berm was planted with much the same method in mind. 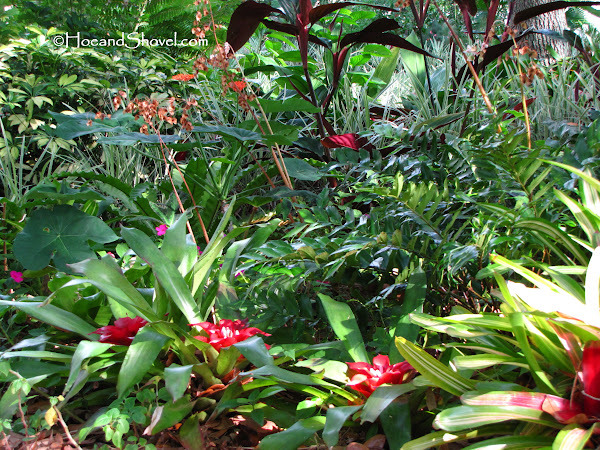 A mixture of natives and a wide variety of fitting tropicals blending together offering a calming effect for the viewer. A garden discreetly and eternally touches the heart of anyone willing to pause and breathe it in. The majestic Australian Fern is a favorite from any angle. It is tucked to the side of the central pathway where it can be seen from just about any point in the back gardens. Seating arrangements serve as focal points adding structure whever they are placed. Prevalent morning shade in the circle garden allows for a cool meditation spot. 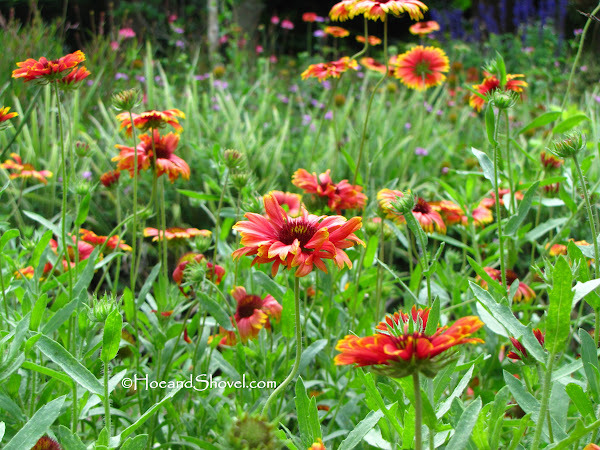 Brightly colored wildflowers continue to catch my eye at every turn. An unusual sight at Hoe and Shovel but much loved this spring. 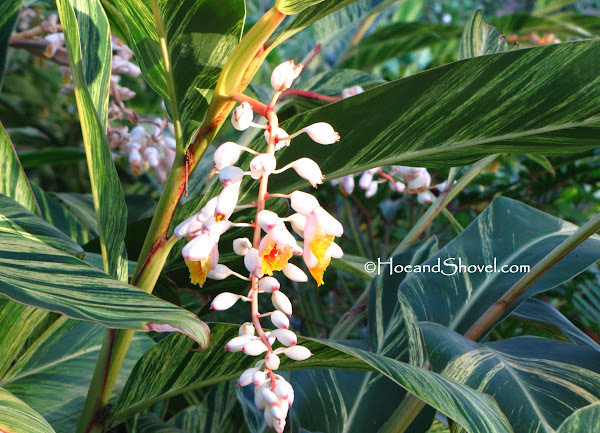 The dangling shell ginger blooms vie for the attention of any passersby. We will savor their loveliness while they last. When they fade it will be another spring before they return. Since replacing the front lawn turf with low-lying ground covers mowing chores have been reduced dramatically. Chairs placed at the end of the curvy path remind us to take some extra moments to relax. From the front street-side butterfly attractors take up the sunniest corner available at Hoe and Shovel. The seating in the previous photo is tucked into the upper right corner of this photo (if you could see it from this vantage point). It's likely you'll be seeing more of these favorite vignettes throughout the summer. As my eye gravitates to them so does my camera. Thank you for coming along with me to some of my favorite places in the garden. That Australian fern is quite dramatic! I love the sea of gallardia in your garden. Enjoy all you have worked so hard to create. What a way to start my day...with a walk through your garden. Thank You! I don't think I have seen a roundleaf begonia. Guess I'll have to look for one. Love the leaves on it. I have a few begonias (my star begonia (begonia heracleifolia) is my favorite. I agree that a garden is the perfect place to work out the burdens of the day. Non-gardeners can't imagine how relaxing it is. I can see why these are favorite views for you. They show all the care and planning you have put into proper siting of the plants and your great design. Is that agastache, standing tall with purplish spikes, in the picture of your front garden? 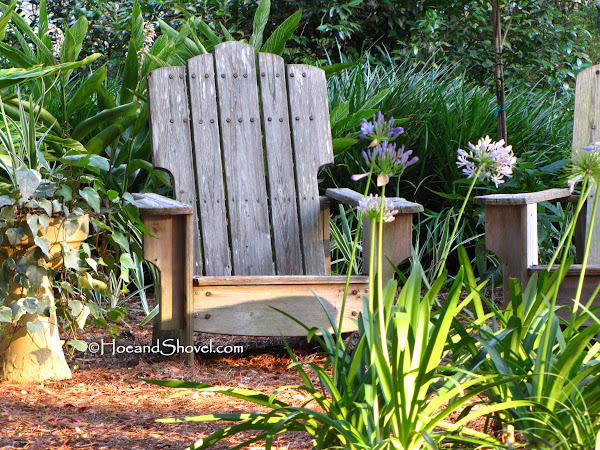 Hope your Memorial Day weekend includes some time in you beautiful garden. Oh Meems ~ What lovely vignettes. Your gardens are so lush, colorful and full of diversity. We hardly have any shade as we lost several pine trees to hurricanes and the subsequent bugs that blew in with them. 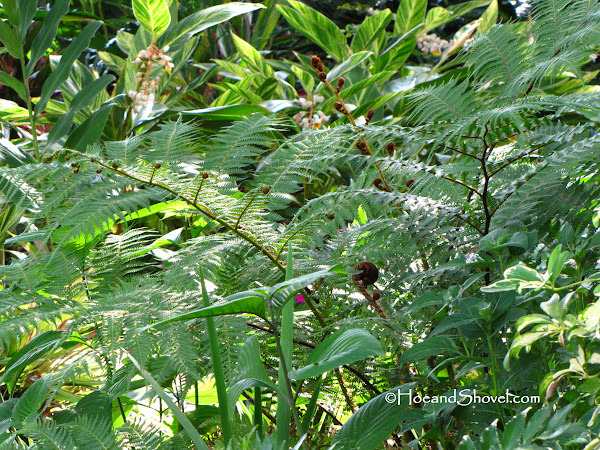 You've probably seen them at botanical gardens... Australian ferns get quite tall if they make past the frosty winters. I don't think I've ever seen one for sale here either. Susan at Simply Susan gave me one she calls a lotus begonia that is VERY similar. I bought these that have a bit more red veining up in Tallahassee of all places. There is a favorite nursery (same place I found my start begonia) that sells great tropicals... I visit every fall and bring back goodies. Thank you... I hope your Memorial Day includes some gardening time, too. Yes, the perennial agastache fades away in winter but returns very nicely in spring. It doesn't bloom as abundantly in summer but green foliage will remain. A real favorite of bees of all kinds and butterflies. It must have been heartbreaking to lose your shade. The live oaks are long-lived and I count on them to shield the brutal rays. Have a lovely weekend. Hi, Meems! How lovely your garden looks! That is the most fantastic plants collection which I have yet seen. Some of the exotic plants are really fascinating but unfortunately won't grow in my area. 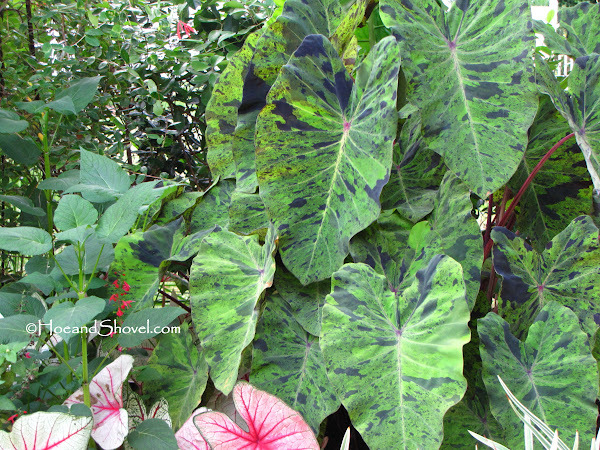 Such - the variegated ginger and caladiums. 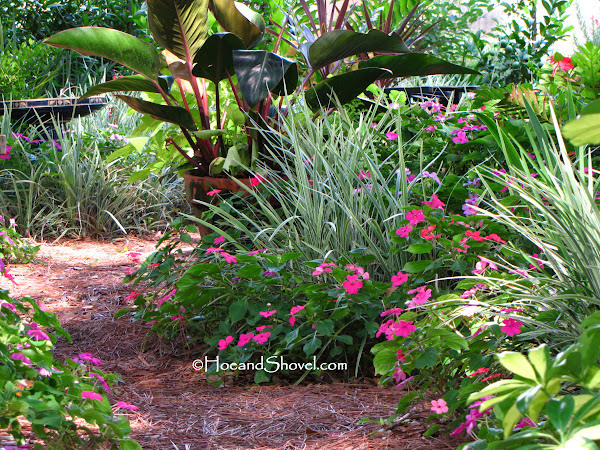 Hey, Meems, those reseeding Impatiens in the liriope are just darling. 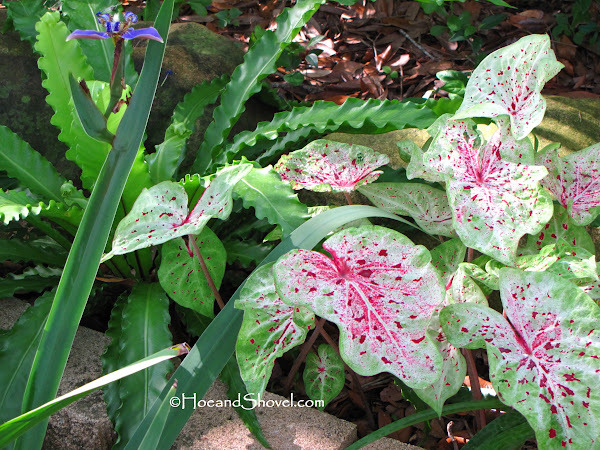 Of course, the caladiums and ferns are beautiful. Can't really do tropical here, but yours are so jungle-y! Love them. Believe it or not impatiens can reseed here. I have had them do that in my garden. They usually don't do as well the second year. Your garden is a tropical paradise. I hope you have a great weekend too. It is convenient we can visit gardens unlike our own via virtual tours. Thank you for your kind words. I suppose you would have to endure patiently for your tropicals to return each spring. You DO get so much colder than us just a short distance south of you. I never would have guessed impatiens seed there. They are tough little plants though. I don't tire of looking at your garden. The foliage, the lushness. I like how you have the curves and nooks that were really highlighted on your video a few weeks back. Meems - I always feel like I'm walking through the Botanical Gardens when you take us on a virtual tour. You have incredible design skills. Meems, Your garden is such a feast for the eyes. Thank you for bringing us along. Just beautiful! 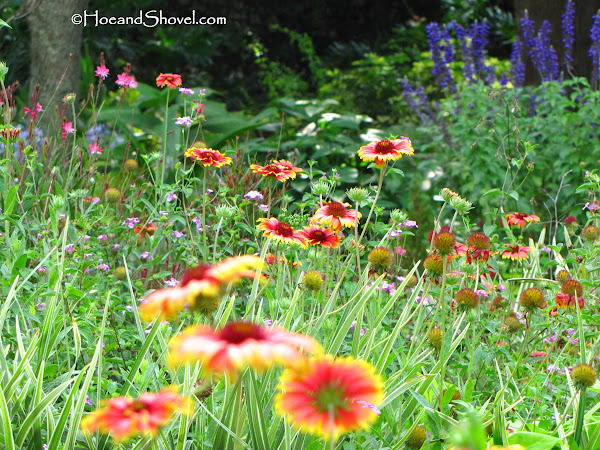 I never tire of taking a tour through your garden - it is so lovely right now with all its color. Your front garden sure has filled in nicely. Do you have a birdbath out there for the birds and butterflies to drink from? It's been interesting creating the videos. It makes me feel like I'm helping the reader "see it" better. That's my hope anyway. It is always fun to walk through someone elses garden isn't it! Gardeners just like other gardens. :-) Thank you for coming along today. Always happy to see you! Thank you. There is a birdbath to the right of the adirondacks in the front gardens. You are so right... the mysteries of the garden! Meems - Your garden is ALWAYS so inspirational!! Hey Meems...Thanks for taking us along on your beautiful garden stroll. You are so right about the feeling a garden evokes in a person. That feeling of peace and contentment is a sure sign that you've succeeded in achieving a garden that speaks to your soul. It's that part of us...deep down inside...working its way to the surface...our essence reflected in the garden. How wonderful and lucky we all are to be gardeners...expressing our inner most being through plants and nature. Good to hear from you... glad to see you back in action. :-) Thank you. It IS who we are and what we love, too. So blessed to be able to express it through gardening and then the garden gives back in rich rewards. Thanks, Susan.